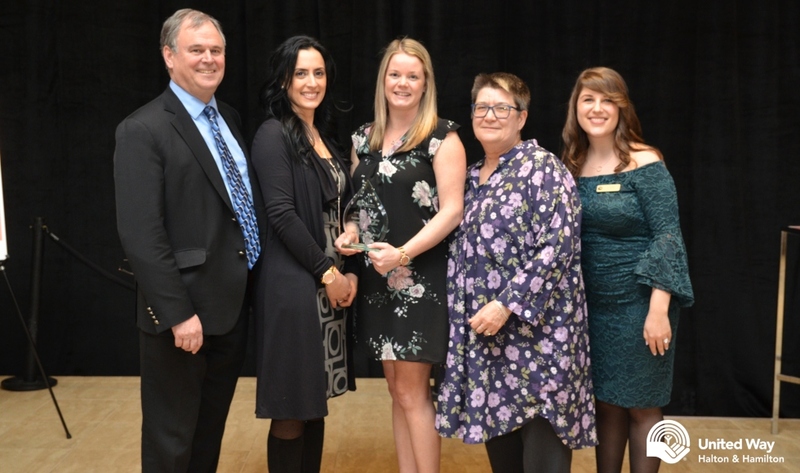 Roger Couldrey, Melanie Garaffa, Nicole Moning (Staff Chair) and Philippa Carter (Faculty Chair), receive the Outstanding Leadership Campaign of the Year award from Corinne Roynon (far right), of the United Way of Halton and Hamilton. The university’s 2018-19 United Way employee campaign wrapped up February 1, reaching 98% of its $290,000 goal. McMaster’s efforts received the Outstanding Leadership Campaign of the Year Award from the United Way of Halton and Hamilton at a ceremony on April 3. The award recognizes employee campaigns with several large donors over $1200. The overall United Way regional campaign surpassed last year’s goal. In total, a record $10,875,000 was raised, marking a milestone for the organization and the community. This year’s McMaster campaign highlights included the Pull4Mac bus pull, an online auction, and individual donations including payroll deductions. The campaign is run by employee volunteers. This committee is looking for new members with skills in event management, project management and communications – or join the committee to network with other employees and learn these skills. No personal fundraising is required. Meetings are held during work hours. Read more about volunteer opportunities. Magnus, a titan arum in McMaster's biology greenhouse, is just about ready to bloom. Warning: they don't call it a "corpse flower" for nothing. Fourth-year kinesiology students help residents of Caroline Place understand some of the health challenges of getting older.